We have two chances of wintry precipitation on Thursday night into Friday and again during the weekend. The big question is whether the precipitation will be snow, sleet or just plain rain. On Wednesday, winds turn more southwesterly, allowing temperatures to rise into the upper 30s to around 40. However, winds will continue to strengthen in advance of a cold front, leading to wind chill values to feel about 10 degrees colder. Another cold night is expected as high pressure builds southwest of the area. Lows will fall into the upper teens and 20s with light winds and a mainly clear sky. The weather gets more interesting on Thursday and into the weekend. On Thursday night, the National Weather Service says a fast-moving system via the southern branch of the jet stream will provide a taste of winter. “The precipitation type looks to be mainly snow through Thursday night with a changeover to plain rain for far eastern sections,” the NWS says in its forecast discussion. “The timing works out that the Friday morning commute will be impacted to some degree with cold ground temperatures to start, so snow should stick on most surfaces. For now thinking a general 1 to 2 inch snowfall and perhaps in the 2 to 3 inch range in far northwestern sections.. It says a “more significant weather event” comes this weekend. Exactly, what type of precipitation we get from that storm system depends on its track. “Places that are mainly all rain will get about 2 inches of rain, before the colder air plows in. Therefore, a quick freeze of all surfaces could make for hazardous travel during Sunday night,” the NWS. Today: Partly sunny, with a high near 36. Wind chill values between 10 and 20. West wind 7 to 11 mph. Tonight: Mostly clear, with a low around 17. Wind chill values between 10 and 15. Northwest wind around 8 mph. Thursday: Mostly sunny, with a high near 28. Wind chill values between 10 and 20. North wind around 6 mph becoming calm in the morning. Thursday Night: Snow, mainly after 1 a.m. Low around 24. South wind around 5 mph becoming calm in the evening. Chance of precipitation is 80 percent. New snow accumulation of 1 to 2 inches possible. Friday: Rain and snow before 1 p.m, then a slight chance of rain between 1pm and 4 p.m. High near 39. Calm wind becoming southwest around 6 mph in the afternoon. Chance of precipitation is 80 percent. New snow accumulation of less than a half inch possible. Friday Night: Partly cloudy, with a low around 21. 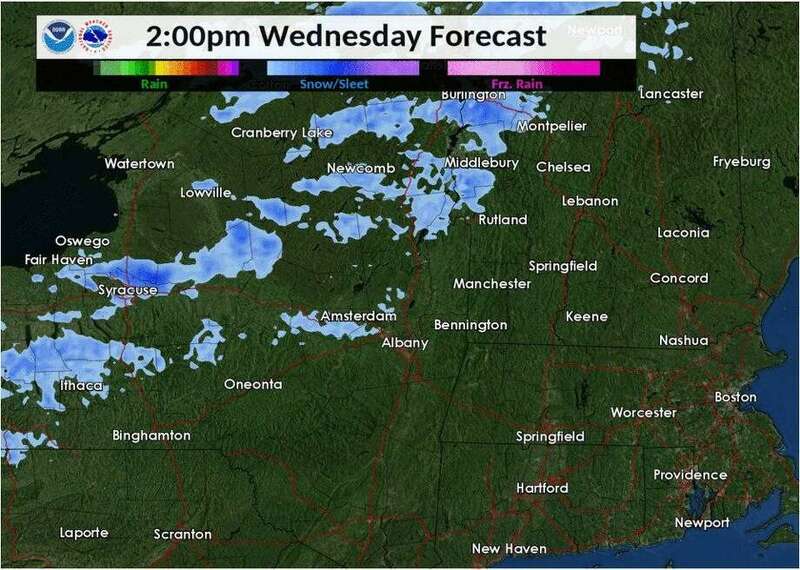 Saturday: A 30 percent chance of snow after 1 p.m. Partly sunny, with a high near 30. Saturday Night: Snow before 9 p.m., then snow showers after 9 p.m. Low around 25. Chance of precipitation is 90 percent. Sunday: Freezing rain and sleet before 8 a.m., then rain and snow between 8 a.m. and noon, then rain after noon. High near 39. Chance of precipitation is 90 percent. Sunday Night: Snow likely before 9 p.m. Mostly cloudy, with a low around 10. Chance of precipitation is 60 percent. M.L.King Day: Mostly sunny and cold, with a high near 19. Monday Night: Mostly clear, with a low around 8.